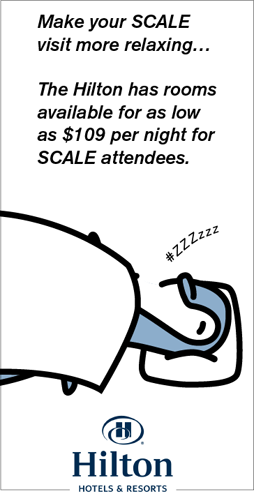 Save the date for SCALE 10X! Los Angeles, CA -- Next year the Southern California Linux Expo will observe the 10th anniversary of the first SoCal Linux Expo. From a one-day event that drew 400 people, SCALE now routinely draws over fifteen hundred people to three days of seminars on Free and Open Source Software. So save the date! SCALE 10X will be held on the weekend of Jan. 20-22, 2012 at the Hilton Los Angeles Airport hotel.